Well I can't claim anything but luck on my part or at least bad luck on the "goats" part but the Widow helped fill another tag, took this doe last Fri morning. I've figured out stalking these critters practically any shot opportunity is a good shot opportunity so I aint complaining. Black Widow LBX 62@27, AD cabon and WW broadhead. Good for you Doug, that can't be an easy task. Congrats Doug! I'm sure this won't be your last animal this year. Way to go Doug. Fine shooting. Way to go Doug Theres some mighty fine eating!!! That background in the pic, makes my heart ache. CONGRATS Doug! You are one tough predator! well done! looks like you live in a wonderfully part of the world. Doug ~ Great Job. 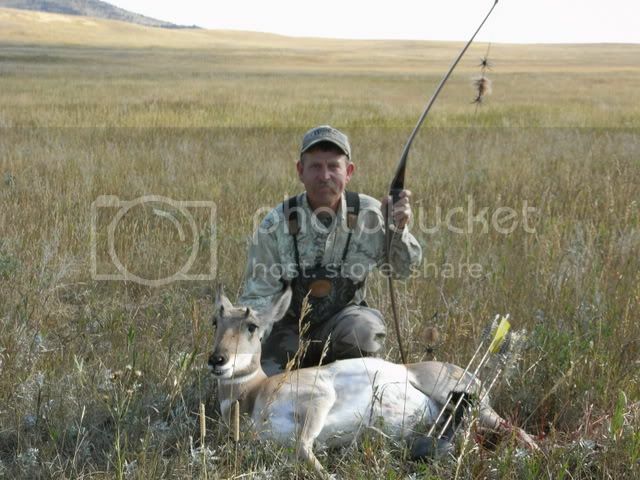 I've been chasing antelope around Montana with my recuve for 5 years now without success.